With minimal ingredients, little preparation, and quick-cooking time, this sushi-inspired salmon dinner is as easy as calling for carryout. Wasabi paste is a ready-to-use mixture of dried horseradish, mustard, food coloring, and water. You can find it in most grocery stores. Preheat oven to 450° with rack in top third. For the sauce, whisk together soy sauce, vinegar, wasabi paste, and honey; stir in scallions. 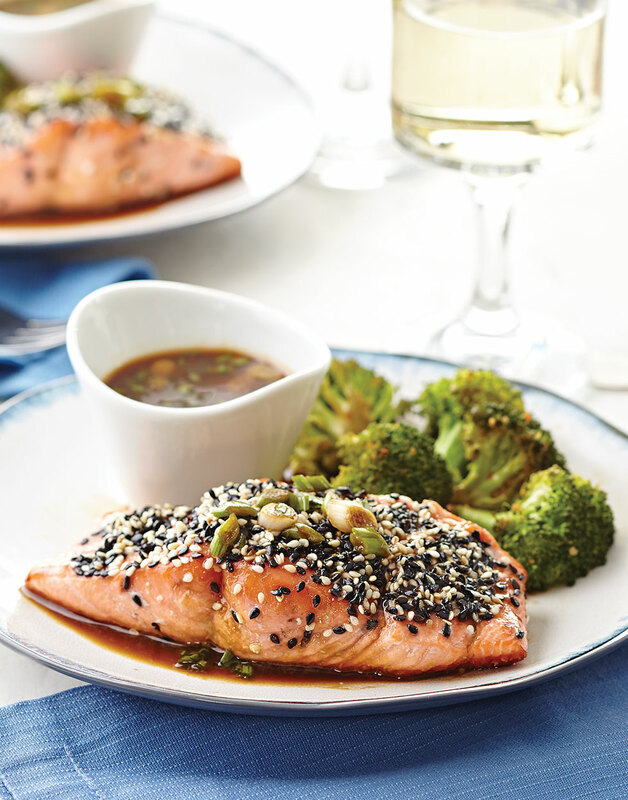 For the salmon, combine black and white sesame seeds. Coat salmon with nonstick spray and top with sesame seeds. Heat oil in an ovenproof nonstick skillet over medium-high. Add salmon, seed sides up; cook until bottom is crisp, 5 minutes. Transfer skillet to top rack of oven and roast salmon to desired doneness, or until a thermometer inserted into salmon registers 140° for medium-well, 3–4 minutes more. Serve salmon with sauce.